Geisel School of Medicine post-doctoral researcher Elaina M. Melton, PhD, has received the National Institutes of Health (NIH) Ruth L. Kirschstein National Research Service Award (NRSA) from the National Heart, Lung, and Blood Institute (NHLBI) to support her research on two cholesterol-related diseases, atherosclerosis and xanthomatosis. “This is an important and prestigious fellowship that will help Elaina Melton to become an independent investigator in the near future,” says Ta-Yuan Chang, PhD, a professor of biochemistry at Geisel. Melton was awarded the fellowship “on her first try which is very rare for these kinds of awards,” Chang says. Melton is a postdoctoral researcher in Chang’s lab. 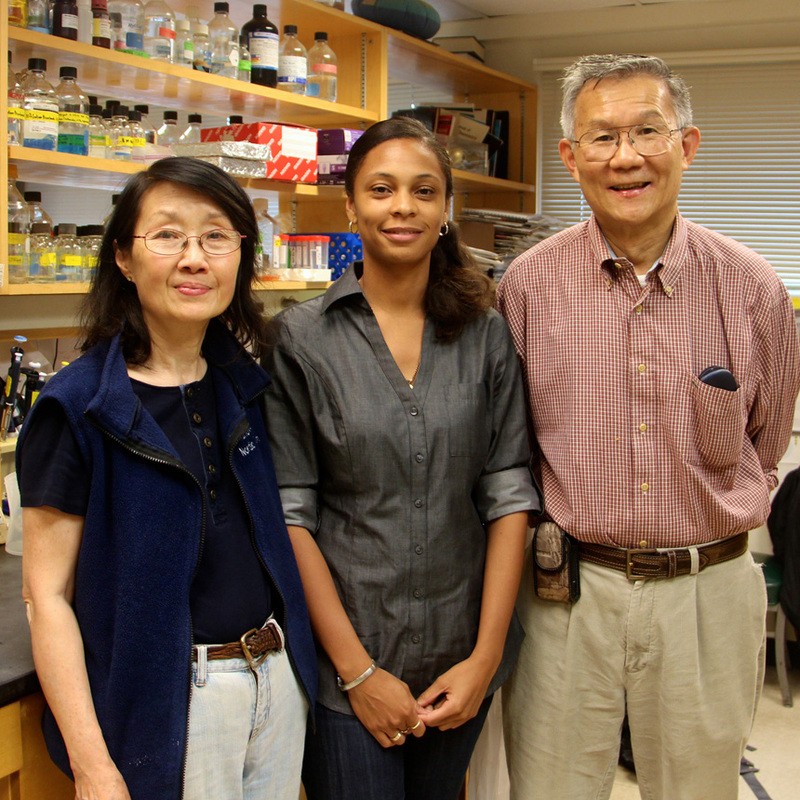 Elaina Melton (center) with Catherine and Ta-Yuan Chang. The NRSA provides funding for up to three years for promising early-stage postdoctoral researchers who have the potential to become independent investigators in health-related research projects. The NHLBI is committed to training and mentoring emerging scientists and physicians seeking the cause of disease and enables the translation of basic discoveries into clinical practice. Melton’s research will be funded for two years. Chang has spent many years studying the role that the gene ACAT1 plays in multiple human diseases, including Alzheimer’s and atherosclerosis, a hardening of the arteries due to buildup of plaque. ACAT1 catalyzes the conversion of cholesterol into a storable form called cholesterol esters. A buildup of cholesterol esters in macrophages (white blood cells) within an aortic lesion is a hallmark of atherosclerosis. Melton is studying the effects of inactivating ACAT1 in macrophages on the progression of atherosclerosis. Her research involves the use of atherosclerosis mouse models engineered to be born with or without the ACAT1 gene in their macrophages. “We are putting macrophage-specific ACAT1-knockout mice on a high cholesterol diet to induce atherosclerosis,” Melton explains. “We’ll then characterize the atherosclerotic plaque by assessing plaque size and composition.” Her findings will give deeper insight into how ACAT1 is involved in atherosclerosis. Another goal of the research project is to determine the impact of macrophage-specific deletion of ACAT1 on the progression of xanthomatosis. Xanthomatosis is a disease where cholesterol deposits build up under the surface of the skin. Melton earned her Ph.D. at Albany Medical College in cardiovascular science where she studied the mechanisms of a protein--fatty acid transport protein 2--in trafficking fatty acids to complex lipid pools. Her work at Albany gave new insight into the understanding of diabetes and was supported by an NIH pre-doctoral fellowship. According to Catherine Chang, Ph.D., co-principal investigator in the Chang lab and Ta-Yuan’s spouse, Melton received excellent training as a graduate student and has a great personality to be a principal investigator. “Elaina is very calm, with good attention to detail,” Catherine Chang says. For Melton, her new NIH award will help pave the way towards her goal of becoming an independent research scientist, leading her own laboratory at an academic research institution.